This stainless steel cube is the anchor for many accessories. Use all four sides to mix and match accessories to create a combination that is right for your unique application. 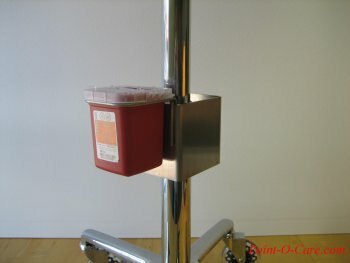 This two piece cube makes it simple to hang accessories on the post of your mobile workstation, IV pole, or any vertical pole at point of care. Oversize knob allows easy placement of the accessory block. Finger tight clamping pressure will hold the cube at the desired position. Quick, no-tool installation allows the block to be repositioned as often as necessary without a call to the facilities department. 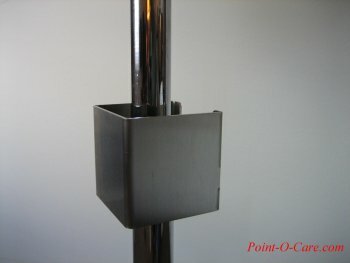 The heavy 11 gage brushed stainless steel cube can be installed on any vertical pole 2 inches in diameter. Wipe clean or remove and wash up at the sink. Approved for all standard cleaning methods. We are working on additional accessories. Check back soon for more options. Accessories sold separately. Patents are pending. This heavy 11 gage brushed stainless steel section is the anchor for many of our accessories. You can easily create a work station unique to your application by using different accessories. This is a product we could not figure out how to install without tools. So we kept it simple. Only four screws need to be anchored into your wall for installation. Once that is done you can mix and match accessories until the cows come home. You can use the same accessories with the Accessory Block and mix and match in seconds. No tools required. Just hang the tools you need on the rail for easy accessibility. Wipe to clean. Approved for all standard cleaning methods. We are working on additional accessories. Check back soon for more options. Accessories sold separately. We have bundled our products to create this versatile wall-mounted workstation. Keep vital items off the counter and within easy reach with the easy to install accessory rail with accessories. Keep examination gloves in easy reach by having them either on the pole mounted accessory block or on the accessory rail. These glove dispensers can be used individually or in groups to fit the specific requirements of your staff. Slide over the Accessory Block or the Accessory Rail for out of the way yet convenient storage of the most important tool in the hospital and lab. White plastic construction for easy clean up. 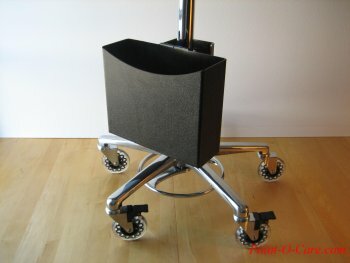 This basket is incredibly handy if you turn your Mobile Workstation into a computer on wheels. 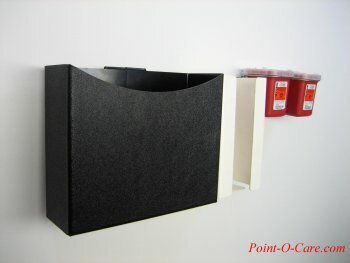 A great place to store papers and notebooks. Simple installation; slide the hanger over the edge of the Accessory Block or Accessory Rail. You can also use it for a rubbish container. Simply slide the wire over the edge of the Accessory Block or Accessory Rail for safe unrestricted access to this vitally important container. The placement of this hanger allows a sharps container to be within reach while remaining unobtrusive. The minimalist design disappears when a sharps container is installed giving the impression the container is floating in space. Designed to accommodate sharps containers in both quart and tray size. Hanger is made of stainless steel or clear plastic for safe simple cleaning. Put your laptop on the cart and a UPS on the base and you have a mobile computing station that can work independent of the grid for 20 hours or more. 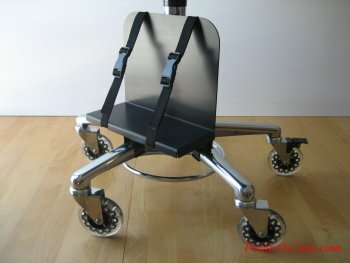 This sturdy cradle clips to the base of your Mobile Workstation or other 5 arm base to present a secure platform for placement of heavy equipment which does not require constant interface. Strong polypropylene webbing straps secure your equipment to the steel base. Two piece quick disconnect buckles permit equipment to be switched in seconds. This simple cradle allows your Mobile Workstation to become a mobile office. 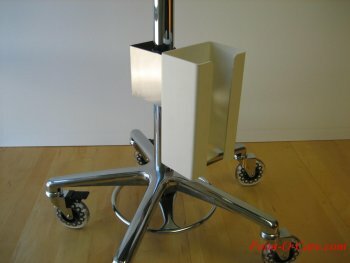 Place a CPU or a UPS in the cradle for safe accessibility. Secure transport of equipment from laboratory to pharmacy to point of care. Assembles to the base of your Mobile Workstation in seconds. No tools required! Remove for cleaning or wipe clean. Approved for all standard cleaning methods. Works with standard 5-arm base.